The importance of mathematics in virtually every university discipline makes it essential that we provide students with a strong foundation. This foundation must be established in algebra, geometry, trigonometry, calculus, and increasingly, probability and statistics. Dedicated to helping our students reach their full potential in mathematics, we provide extensive support for all students: we encourage qualified students to challenge themselves by writing math contests and senior students to pursue AP credits; we enhance our students' learning through the use of technology; and we encourage hard work by holding students accountable. In short, we are providing a superior quality of training. how mathematics leads to unforeseen applications including computer science and game theoretical approaches to economics and politics. We undertake to offer the resources to help the mathematically challenged overcome the obstacles that impede them; we endeavour to provide stimulating contexts to lead the mathematically gifted to realize their talents; we hope to offer every student an opportunity to appreciate the logic, the beauty and the sheer fun of our discipline. Successful completion of MCF3M Functions and Applications will prepare students for, Mathematics of Data Management, MDM4U. The majority of university bound students, and students planning to study technology or apprenticeship programs at college, are expected to take the MCF3M Functions course. In the delivery of the program, emphasis must be placed on helping the students to build solid foundations so that they will keep open doors to their own futures. Note: The Advanced Functions course must be taken prior to or concurrently with Calculus and Vectors (MCV4U). This course builds on students’ previous experience with functions and their developing understanding of rates of change. Students will solve problems involving geometric and algebraic representations of vectors and representations of lines and planes in three dimensional space; broaden their understanding of rates of change to include the derivatives of polynomial, sinusoidal, exponential, rational, and radical functions; and apply these concepts and skills to the modeling of real-world relationships. Students will also refine their use of the mathematical processes necessary for success in senior mathematics. This course is intended for students who choose to pursue careers in fields such as science, engineering, economics, and some areas of business, including those students who will be required to take a university-level calculus, linear algebra, or physics course. Calculus is an essential tool for advanced study in many disciplines. This interdisciplinary approach to calculus includes applications in physics and economics to illustrate the importance of calculus to the physical and social sciences. Topics covered by all students include: limits and continuity; differential calculus of functions of a single variable including techniques of differentiation; the Mean Value Theorem and determination of extremes; applications of differential calculus with particular emphasis on physics and economics; differential equations and slope fields; integral calculus of functions of a single variable including the Fundamental Theorem of Calculus and techniques of integration; applications of integral calculus. Students pursuing the BC designation will also study: polar coordinates and parametric equations; improper integrals; infinite sequences and series, Taylor Series. Students will study toward gaining the AP Calculus AB/BC credits in IDC4U. Students wishing to enroll in this course should have demonstrated a proficiency in previous math courses as well as a sincere desire to work at the accelerated pace required of the Advanced Placement curriculum. This course broadens students’ understanding of mathematics as it relates to managing data. 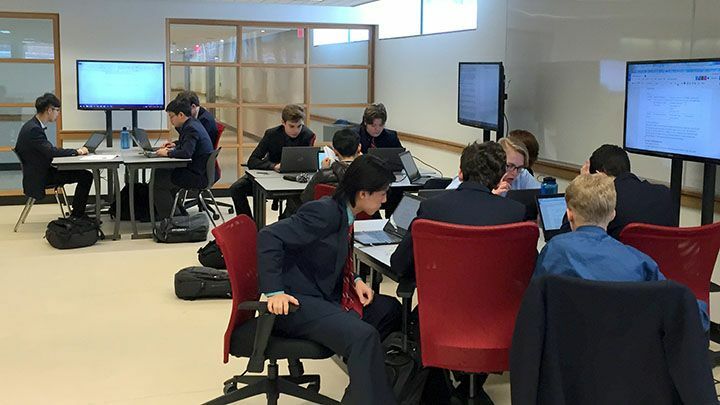 Students will apply methods for organizing large amounts of information; solve problems involving probability and statistics; and carry out a culminating investigation that integrates statistical concepts and skills. Students will also refine their use of the mathematical processes necessary for success in senior mathematics. Students planning to enter university programs in business, the social sciences, and the humanities will find this course of particular interest. Topics to be studied include: tools for data management; statistics of one variable; statistics of two variables; permutations and organized counting; combinations and the binomial theorem; introduction to probability; probability distributions; the normal distribution. 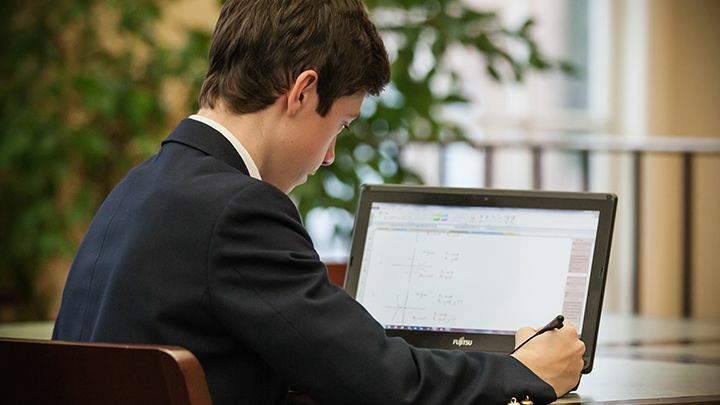 Students will employ a variety of resources including TI-83+ programs, Fathom statistical software, a video series entitled Decisions Through Data; review sheets; online applets, online quizzes, Excel, and free response questions from previous AP-Statistics exams. OSS Equivalence: This course is cross-listed with MDM4U. Thus, this course will appear as MDM4U on the Ontario Student Transcript. Students must take either MDM4U OR MDM4UP but not both. The use of laptop technology, as outlined in the Laptop Integration Plan, has given students access to additional and powerful resources. Students can access graphing software that enables two and three-dimensional objects to be viewed, rotated, and analyzed. Internet links allow the students to view applets that help to demonstrate many difficult to visualize concepts. Students in grades 9 and 10 need to have a scientific calculator for their math classes; grades 11 and 12 require at least a TI-83 calculator.